Being a fan of sci-fi political satire, I find it difficult to find new authors who are both good story tellers and thought provoking political analysts. So, I was very pleased to find this novel by a young new author who not only is skilled at creating a fascinating and beguiling story arch but also includes a well thought out political dimension to their work. Ismael Sarepta’s novel, Madame Einzige: Amor Fati might best be classified as a near-future cyberpunk novel. The political intrigue, sprinkling of historical references, and complex cast of racially diverse female and male characters make Madame Einzige: Amor Fati a provocative work that keeps the reader engaged with a number of plot twists within a fast-paced story. The book is packed full of historical references, philosophical and ideological debates, and techy nerdom. So while you soak up this book, don’t blink, or you might miss something. The story takes place in 2033 within the desolate landscape of war-torn Central Asia. The world is that of a post-modern state which has developed after some of the most globally significant moments in European and Eurasian history. The main character, Madame Einzige, a self-proclaimed Aryan, finds herself a minority within the large and troubled Eurasian landscape. As a female, a minority, and an ideological outsider, Einzige struggles with the completion of her own agenda, ending the fascist rule of the state and instead becomes embroiled in the efforts of the liberation movement that has unified a number of factions within the region. Ensuing during and prior to the beginning of the novel, cyber and combat based warfare are ongoing between a multitude of factions and the state. A number of well-described fight scenes fill the book with action and suspense that are sandwich between politically charged dialogue and development. Einzige, being a wartime hero to a clandestine group of freedom fighters that she sides with, soon becomes entangled in a web of lies and deceit that reveal the multiple layers of covert actions that are common place within many liberation groups. Madame Einzige herself is a classic character with believable flaws and a strict adherence to a freedom fighting ideologue that is quite familiar to anyone in the western world. One of the most refreshing things about the book, is the development and depictions of groups that symbolically represent the underrepresented and quite often misrepresented populations of today such as the similarities of the factions to Middle Eastern liberations fronts, the village of Tajikistan to indigenous populations, and the numerous spies within the book to a variety of immigrant groups. With obvious connections to religious and anti-religious factions around the world, the unification of the different divisions in the book provides a refreshing counterpoint to the common western notion that all radical factions are the same. By humanizing these types of groups while still pointing out their inevitable corruption and failure, the author builds up the reader’s ability to not only empathize with the characters but to better understand them without the need to agree with them or their ideology. The cast of supporting characters in the book vary in their posturing and roles while avoiding any overt classification thus making them easy to connect with and relate to. Within the media, literature, movies and television as a whole, I’ve noticed an overt masculinization of physically and mentally “strong” female characters. So it was very refreshing to see the juxtaposition of the main physically and mentally capable loner rebel as a female and a minority to the region which she is working in. In addition to this, most of the combat ready characters are refreshingly feminine females. Another thing that I found enjoyable is that there is only one very brief romantic interlude within the entire book, leaving the story line open to focus on in group and out group interplay. Yanush, Madame Einzige’s counterpart takes a backseat to Einzige’s character and while he does save her a number of times via his hacking abilities, it is more often than not Einzige’s own brawn and quick wittedness that saves the day. Even Amir, the male leader of the Red Hat’s, one of the main parties within the coalition, requires the help of Madame Einzige, and seems rather helpless without her. In all, the characters are welcomingly not forced into the normal gender roles associated with certain positions of power which I found to be a major plus. Regarding in group politics, the book depicts the divisions within liberation groups in a time when most only see such organizations as unilateral tools of destruction. By avoiding the idealizing of nongovernmental national organizations and their governmental counterparts, the story exposes the chaos and disunions that are often found within informal organizations. As the social climate and landscape in the book develop, so to do the fascinating characters. Amongst the femme fatales, cyber-punk elite, and uber masculine in the book are the average contributors and unwitting soldiers of the many different factions. Whilst developing captivating characters, the author successfully develops a believable depiction of the ultimate outcomes of civil war. Although I thoroughly enjoyed reading the book, easy reading may not be the best way to describe Madame Einzige: Amor Fati. Some of the best books take a little time to progress and streamline a story, and this book is no different. One thing which someone might notice about the novel is the disjointed first chapter written in a nonexistent computer code. At first glance, it seems like nonsensical gibberish, but after closer inspection it is full of clues about the progression of the novel and history of the main characters. Don’t let the jarring nature of the first chapter fool you, the rest of the book reads quite smoothly. It even seems as if the disjointed code found within the book gives the reader a feel for the cyberpunk essence of the time period, and the fast paced fluid action scenes and poignant philosophical moments found within the book bring together the narrative. So if you feel a little discouraged when reading the first chapter, keep going, you won’t regret it. Overall, Madame Einzige: Amor Fati is a provocative story with a fascinating combination of historical, political and philosophical intrigue which is thought provoking and intriguing. 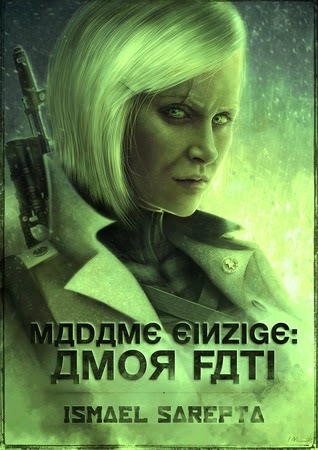 The world of Madame Einzige includes a rich world full of real world historical references woven into a post-apocalyptic Eurasian expanse. With a strong unstoppable female protagonist and a myriad of fascinating supporting characters, this is a book that will not cease to keep you guessing. An enthralling and uninhibited journey, Madame Einzige: Amor Fati is a wonderful Nietzschean depiction of the timeless struggle between ideology and actualization within a world of political and bureaucratic corruption and intrigue. Editor’s note: The author is a friend of the reviewer.